HABIT: Slow growing, dense foliage, bushy unless trimmed into tree form. Fragrant, purple, wisteria-like flowers in spring. They actually smell like grape soda. CULTURE: Any well-drained soil. Moderate to low water and feeding requirements. 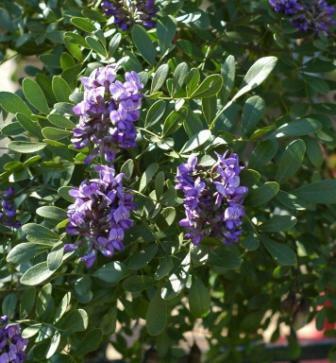 USES: Specimen ornamental tree or large shrub. Drought-tolerant gardens. Can be grown in containers. PROBLEMS: Winter damage in the northern parts of the state. NOTES: Great in Central Texas but needs some protection in North Texas. Native to southwestern USA, Texas and Mexico. 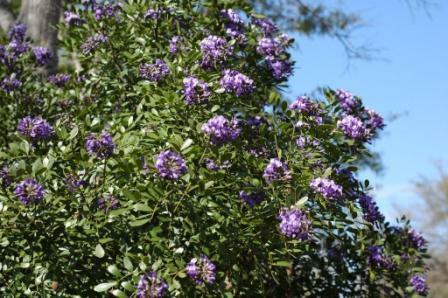 Q: I have a mountain laurel that is 5 or 6 years old that has never bloomed. It is planted in good soil in full sun-any ideas? A: Mine hasn't bloomed the last couple of years because of late freezes injuring the flower buds. Just enjoy the beautiful foliage and celebrate the flowers and their fragrance when they finally come.